The Dragon Rises College of Oriental Medicine Student Clinic in Gainesville is open to the general public by appointment only. However, walk-ins are welcome to make an immediate appointment and may be seen if there are any last-minute openings. All treatments are supervised by a licensed practitioner. The initial appointment includes a thorough exploration of the history of current medical concerns, as well as, details about past medical conditions. We utilize information from birth to the present. The initial visit is also a time when the students and supervisors conduct a thorough pulse examination, which yields information that guides therapeutic intervention. Pulse diagnosis is a vital tool in Oriental medicine, and at Dragon Rises College, we practice a highly refined form of this art. The purpose of a thorough consultation and pulse diagnosis is to account for the many factors contributing to an individual’s medical condition. This enables us to understand the disease process from its inception, provide counsel about the effects of one’s lifestyle, and initiate the most expedient therapeutic intervention. 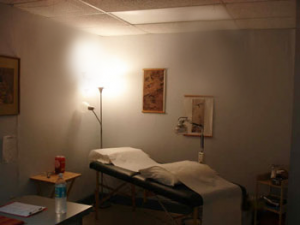 The treatments at the clinic include all of the major modalities within Oriental Medicine. These include: acupuncture, herbal medicine, lifestyle consultation and therapeutic massage. Many of the patients who come to the clinic have no previous experience with Oriental Medicine, and we take the time to explain carefully each procedure. We hope that you will join us in the clinic and realize the benefits that Dragon Rises College has to offer. Please allow up to 2 hours for your treatment. Hours change occasionally for each semester. Please call for an appointment. Click to download new patient form before your appointment. Print them, fill them out and bring them in with you to the clinic. Acupuncture is recognized by the National Institute of Health and the World Health Organization to be effective in the treatment of a wide variety of medical problems. Below is a list of a few health concerns that acupuncture has been effective in treating. (b) is awarded the Dipl.Ac. (Diplomat in Acupuncture) designation upon successful examination by the NCCAOM (National Commission for the Certification of Acupuncture & Oriental Medicine) which is the national standard used for licensing in most states. – Used for a broad range of health issues, including chronic disease, pain, internal medicine, rehabilitation, and prevention based on Oriental medical theory. – Most commonly used for pain management or addiction & detoxification through auricular acupuncture. Acupuncture should only be administered by a practitioner who has specific training in this field, due to risk of improper needling, inadequate understanding of Oriental medical diagnostic procedures, transmission of disease, imbalance of energy, or ethical violations.